If I'm not munching on Mexican food it's likely that you'll find me savoring a delicious Asian dish. 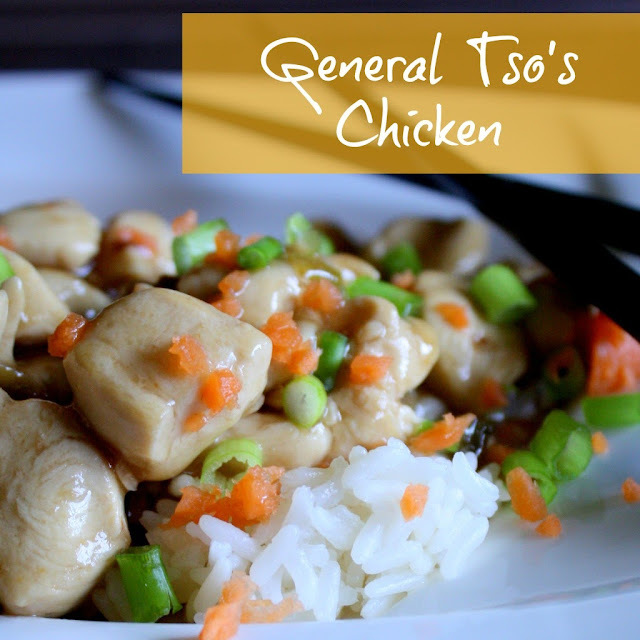 Last week I tried a new Weight Watchers recipe for one of my favorite Asian dishes--General Tso's Chicken. I had my doubts about how this recipe would turn out, but I was pleasantly surprised with the outcome. It was super simple to prepare and the whole family loved it (well, except for my picky eater, of course). Sometimes when I try a new recipe, even though it turns out delicious, if it was too time-consuming or if it required hard-to-find ingredients, I don't put it on our regular dinner rotation. Neither was the case with this recipe. It was just my style--quick and easy-- and I will gladly add it to our regular dinner rotation! In a bowl, whisk together broth, cornstarch, sugar, soy sauce, vinegar and ginger. Heat olive oil in a large skillet over medium-high heat. Add scallions, garlic and red pepper flakes. Cook for about 2 minutes, stirring frequently. Add chicken to skillet. Cook until chicken pieces are begin to brown, about 5 minutes. Add sauce to the skillet and simmer until sauce thickens and chicken is cooked through. This recipe makes 4 serving. Enjoy about 1 cup of chicken with sauce and 1/2 cup of rice for 8 Weight Watchers points plus values.